Secretary for Social Affairs and Culture of the Macao Special Administrative Region Government, Alexis Tam, led a delegation comprising officials of Macao Government Tourism Office (MGTO) and Sports Bureau as well as members of Tourism Development Committee and Macau Grand Prix Organizing Committee to visit several cities in the Guangdong-Hong Kong-Macao Bay Area for familiarization with their tourism attractions and facilities. The mission was organized by MGTO with the aim to foster multi-destination tourism and push forward the work of the Tourism Federation of Cities in Guangdong, Hong Kong and Macao Bay Area. Riding on the mission, MGTO kicked off a two-day Macao travel roadshow in Shenzhen, the last city to visit, today (18 August) to showcase the tourism resources and new brand of Macao as a Creative City of Gastronomy. Secretary for Social Affairs and Culture, Alexis Tam, together with officials of MGTO and Sports Bureau as well as over 20 members of the Tourism Development Committee (CDT) and around 10 members of the Macau Grand Prix Organizing Committee (MGPOC), visited the first two cities in the mission, Guangzhou and Foshan, on 13 and 14 August for a profound experience of the travel itineraries, attractions and facilities. The delegation comprised over 50 members including the Chief of Office of the Secretary for Social Affairs and Culture of the Macao Special Administrative Region Government and member of MGPOC, Ip Peng Kin; MGTO Director Maria Helena de Senna Fernandes; President of Sports Bureau and Coordinator of MGPOC, Pun Weng Kun; President of the Institute for Tourism Studies and CDT member Fanny Vong; Director of Board of Administration of Cultural Industries Fund and MGPOC member Davina Chu, among others. During the mission, Secretary Alexis Tam, Chief of Office of the Secretary for Social Affairs and Culture, Ip Peng Kin, and MGTO Director Senna Fernandes met with Vice Governor of Guangdong Province, Ouyang Weimin, and member of the Standing Committee of Foshan Municipal Committee of the Communist Party of China and Deputy Mayor of Foshan, Liu Junwen, respectively for exchange of insightful perspectives on enhancement of resource sharing and collaborative development. Director Senna Fernandes also met with Director General of Tourism Administration of Foshan Municipality, Jiang Qing, Deputy Director General of Tourism Bureau of Shunde District, Ou Weizhong, and other officials for constructive discussions to share and forge ahead with the initiatives of both destinations as Creative Cities of Gastronomy, and probe into new possibilities for collaboration. 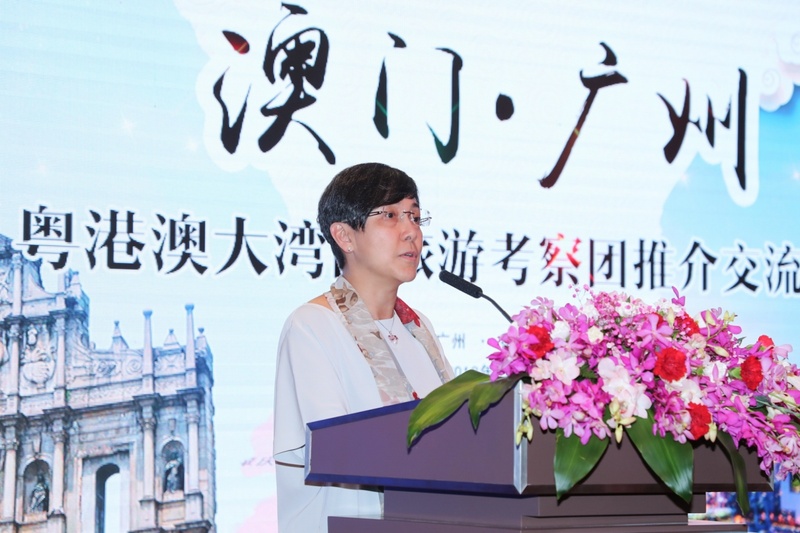 Designated as a member city of the UNESCO Creative Cities Network (UCCN) in the field of Gastronomy in 2014, Shunde has embraced the status for the fourth year and will submit the work progress monitoring report before the end of this year. The meeting has shed inspirations on the four-year action plan of Macao as a Creative City of Gastronomy. 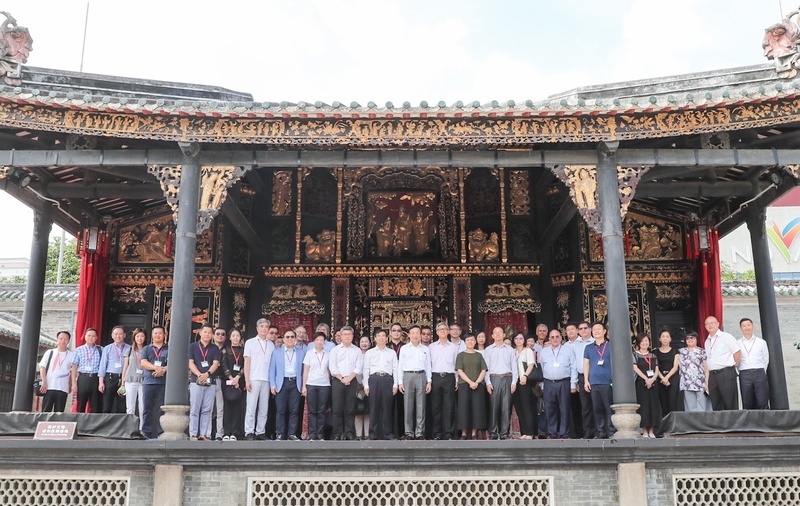 On 13 August, Tourism Administration of Guangdong Province and Tourism Administration of Guangzhou Municipality hosted a destination presentation and networking dinner in Guangzhou, the first stop of the mission, for Secretary Tam and the delegation. Director General of Tourism Administration of Guangdong Province, Zeng Yingru, Chief of the Hong Kong, Macao and Taiwan Affairs Division of Tourism Administration of Guangdong Province, Zhang Guohui, and Director General of Tourism Administration of Guangzhou Municipality, Liu Yumei, were present at the occasion together with other guests. In speaking at the occasion, Senna Fernandes highlighted that the Outline of the Development Plan for the Guangdong-Hong Kong-Macao Bay Area is poised to usher in a new chapter. Coupled with the upcoming inauguration of the Hong Kong-Zhuhai-Macao Bridge, it is set to create a strong and new momentum for the integrated development of Guangdong, Hong Kong and Macao, and further advance tourism cooperation across the Bay Area. She believes the city cluster in the Bay Area will deliver a stronger synergy in the field of tourism and bring forth brand-new travel experiences across the region, leading to a greater shared harvest in tourism, as well as mutual success and collaborative development. MGTO and CDT members continued the mission with a familiarization visit to Nansha, Dongguan, Huizhou and Shenzhen from 15 to 18 August. Their visit was highlighted by an array of destination presentations given by the respective cities to update delegates on their latest tourism trends and provide opportunities for industry networking. Through organizing the mission for familiarization and exchange, MGTO aims to gain a profound understanding and experience of the diverse tourism elements offered by various cities in the Bay Area. The mission also serves to enhance sharing of strengths and resources among the Bay Area cities, enrich multi-destination travel routes and products, and push forward the work of the Tourism Federation of Cities in Guangdong, Hong Kong and Macao Bay Area (the “Federation”), besides familiarizing industry operators with the Bay Area. 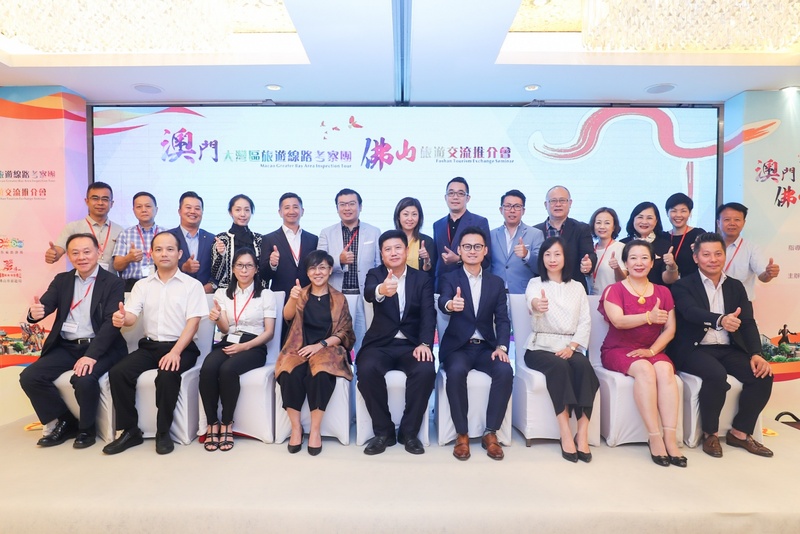 MGTO rolled out a Macao travel roadshow in Shenzhen, the last stop of the mission, to showcase the city’s diversity of tourism resources, events and gastronomy in tandem with its new status as a Creative City of Gastronomy to residents and visitors there. 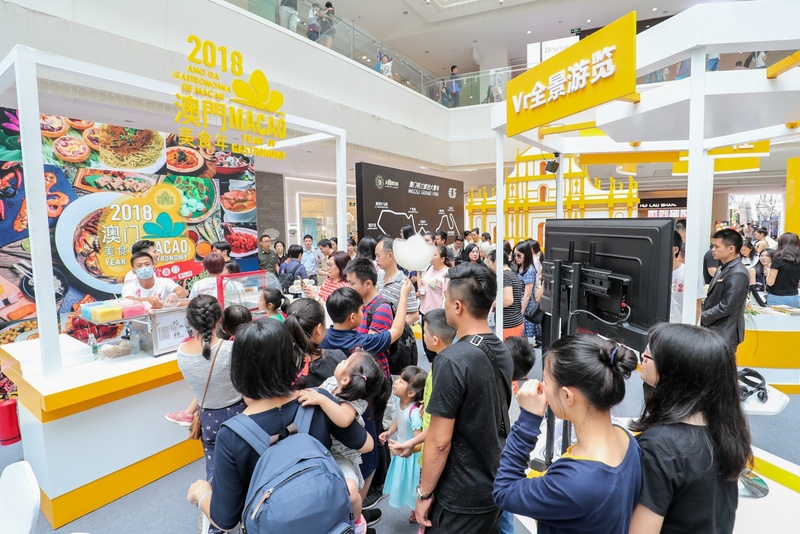 Set up at the popularly frequented Garden City Center in Nanshan District, Shenzhen over the weekend, 18 – 19 August, the roadshow attracted many pedestrians, opening their eyes to a palette of travel experiences offered by Macao. 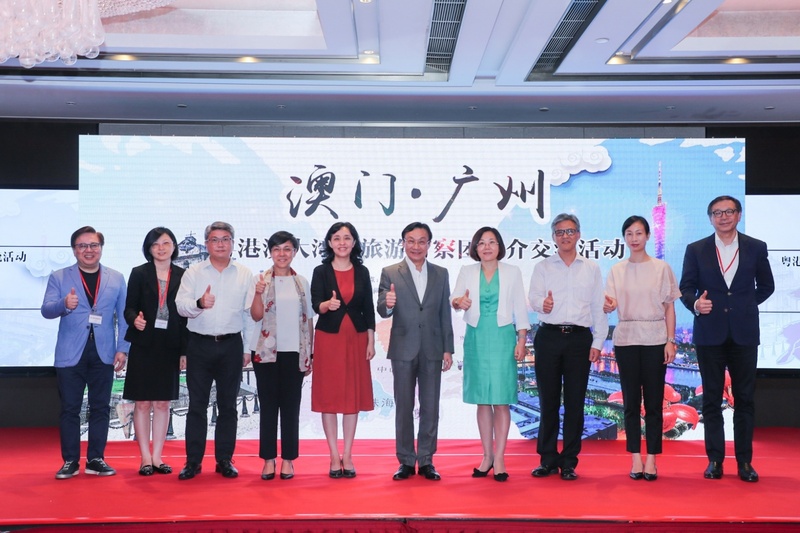 This April, the Tourism Federation of Cities in Guangdong, Hong Kong and Macao Bay Area held its first General Membership Meeting in Guangzhou to confirm an array of major tasks to carry out. As a member of the Federation, MGTO is keenly committed and supportive to the work of the Federation, capitalizing on the unique strengths of Macao to push forward tourism development across the Guangdong-Hong Kong-Macao Bay Area together with other member entities. The Tourism Federation of Cities in Guangdong, Hong Kong and Macao Bay Area was established in December 2017, comprising the tourism bodies of the nine cities of Guangdong Province – Guangzhou, Shenzhen, Zhuhai, Foshan, Huizhou, Dongguan, Zhongshan, Jiangmen and Zhaoqing – as well as Tourism Commission of the Government of the Hong Kong Special Administrative Region and Macao Government Tourism Office. Upholding the principle of “concerted development, joint branding and market sharing”, the member entities are joining hands to build a world-class travel destination. In the same month, representatives of various tourism industry associations from across the Bay Area signed the “Guangdong-Hong Kong-Macao Bay Area Travel Trade Cooperation Agreement” in Hong Kong, with the aim to map out new multi-destination tour routes and jointly forge a tourism brand with resource advantage.